Greetings guys! I'm back at work today and I'm definitely regretting staying up the past three days until 5 a.m. I'm a total and complete night owl. Only two of work and then I'll have off once again for a few days. I'll admit this schedule is making me wish I could work only three days a week. But then I wouldn't be able to afford my crazy nail polish addiction, haha. Oh yeah, and bills. Can't forget about those. But let's talk about something a little more exciting shall we? Like the return of CDB Lacquer! Tomorrow Friday August 1st, CDB Lacquer is back in business as the store relaunches with a complete makeover. The Celestial Trio that was released in limited quantity before the relaunch will be back in stock. 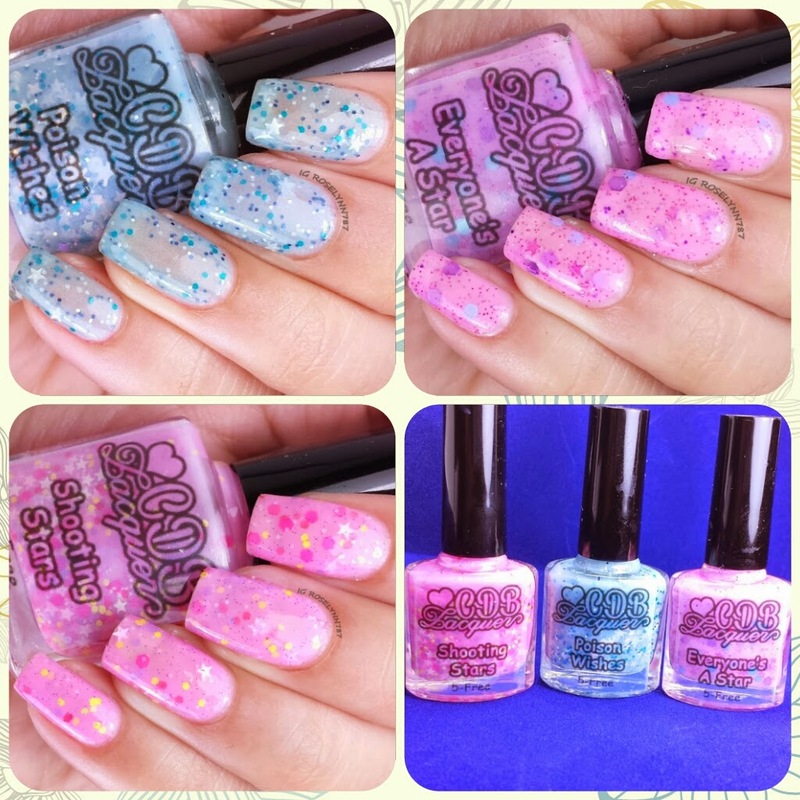 Today I'll be showing you swatches of these three polishes a long with a quick overview. Let's take a closer look at the trio that will be in stock tomorrow. 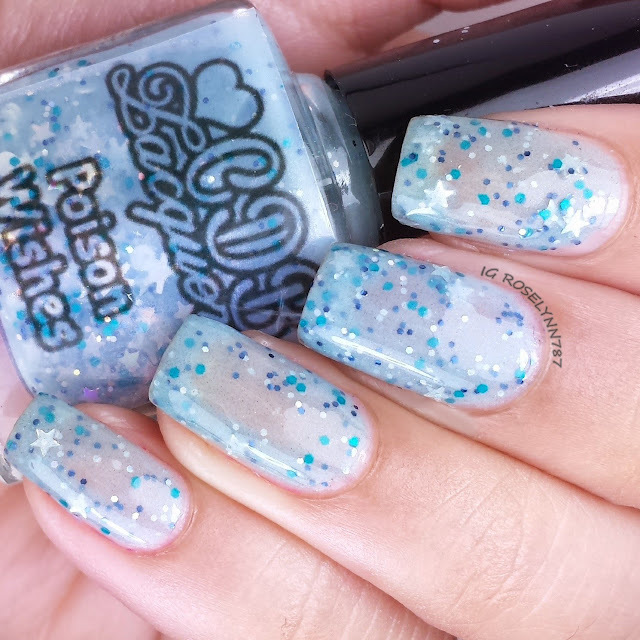 Poison Wishes is a teal blue crelly filled with teal, dark blue, white glitters and white star glitters. I'll start off by saying it's my favorite one from this trio! I love the unique shade of teal blue, there is just something about the color that's very stunning. It suits my skin-tone so well. Swatched over a clear base coat, used two thin coats, and sealed with a fast drying topcoat. I decided for the swatches I would use two coats for a cute semi-sheer look. You'll definitely achieve full opacity if you opt for the third layer. Formula was great and consistent with what I'm used to from CDB Lacquer. Additionally Poison Wishes can also include white skull-shaped glitters, which you can use for placement like I did here. 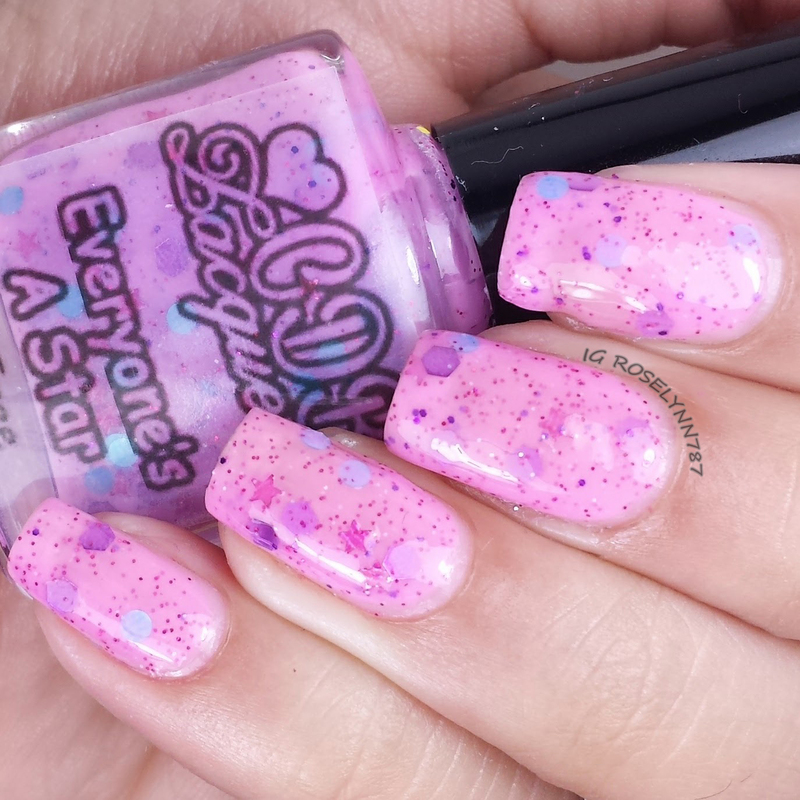 Everyone's A Star is a light fuchsia crelly filled with purple, pink and light teal circle glitters as well as pink star-shaped glitters. It's really hard to pin-point the shade, it's a definite mix between light purple and light pink. The glitter combination is pretty cute, the teal circles draw me in. My only wish is that it would be a little more lilac in color. Swatched over a clear base coat, used two thin coats, and sealed with a fast drying topcoat. I found this beauty to be really opaque with only two coats but it is recommend you use three. Formula was great and had a equally good consistency. I experienced no glitter fishing or clumping with the application. Definitely seal it with a topcoat. 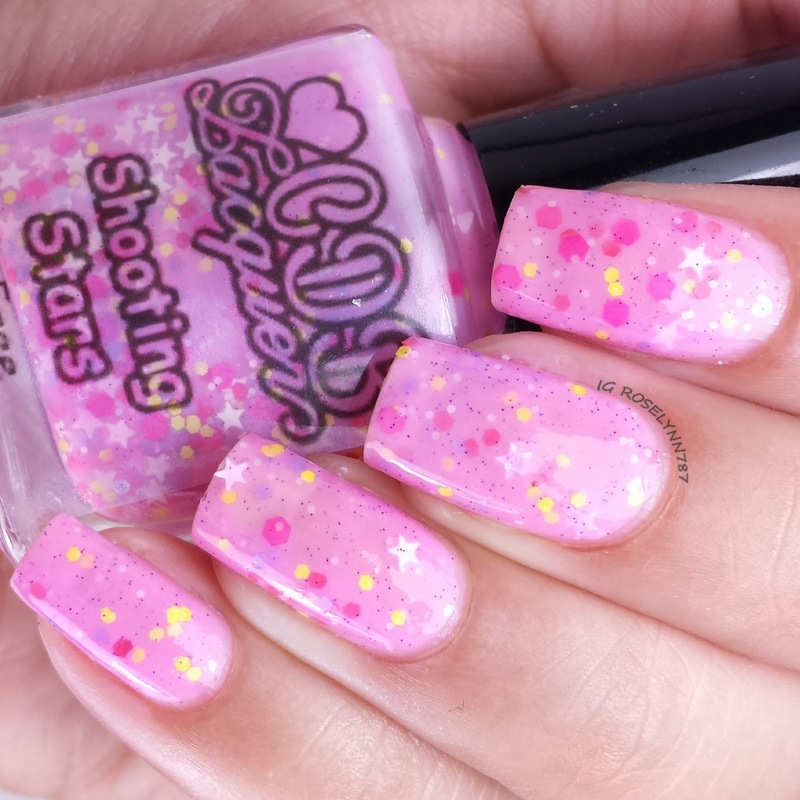 Shooting Stars is a bubblegum pink crelly filled with yellow and hot pink circle glitter as well as white star-shaped glitters. 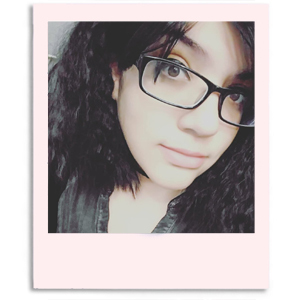 I normally don't like the color pink on my skin-tone but this specific shade is too cute not to love. It's so feminine and happy. Swatched over a clear base coat, used two thin coats, and sealed with a fast drying topcoat. I only used two coats because I found it to be opaque enough to my liking but three coats is recommend. Great formula that requires absolutely no fishing for glitters. 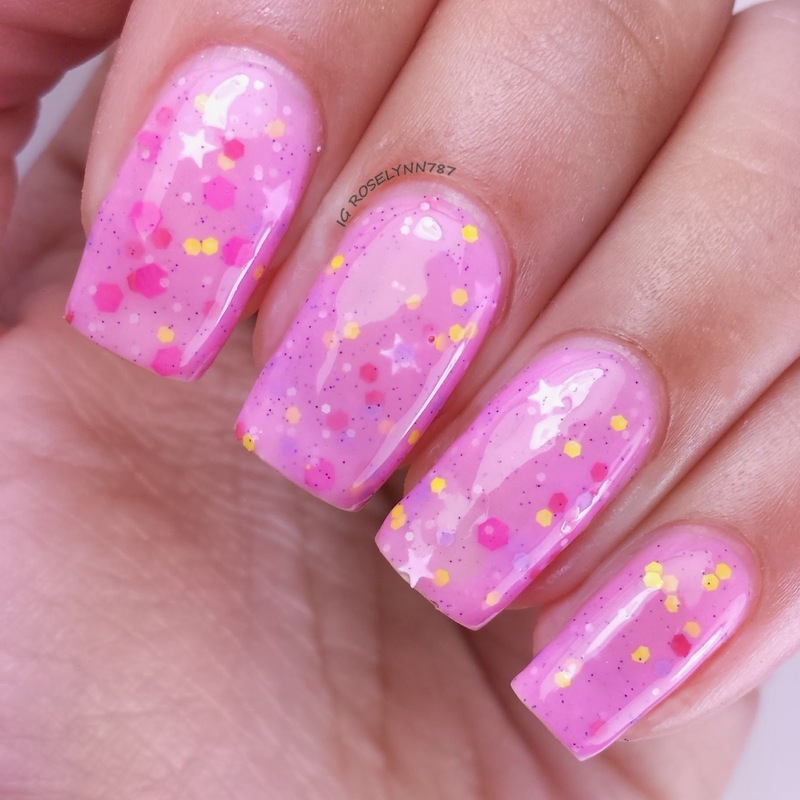 I suggest using a topcoat to seal in the glitters and smooth out the layers. 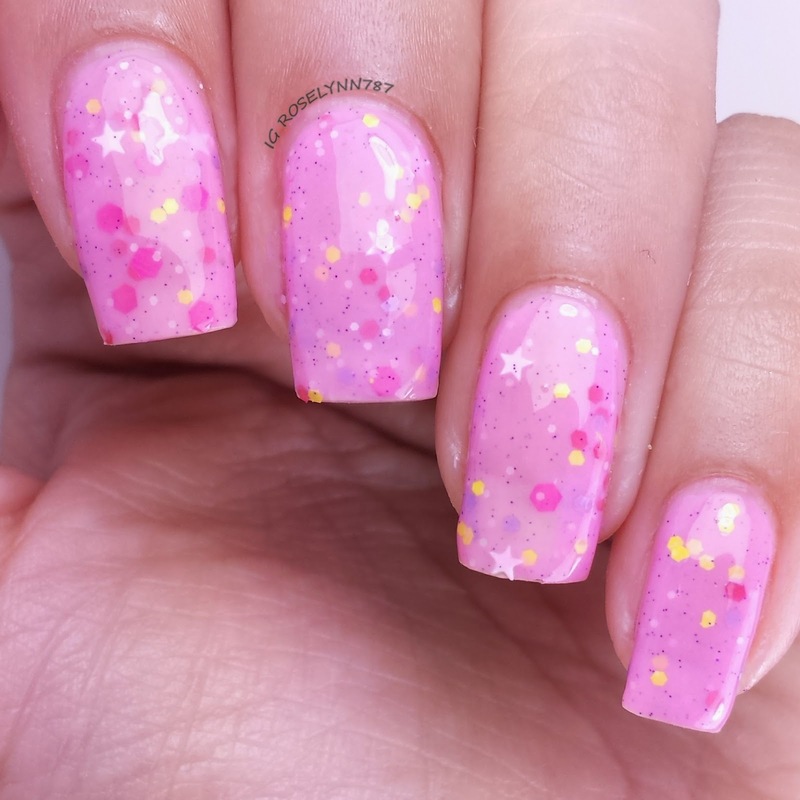 The Celestial Trio collection is overall extremely cute and girly. I can see Poison Wishes being a good selection for the upcoming Halloween season as well. I like calling this a feel good collection so basically a set of nice crelly polishes for the everyday girl. CDB Lacquer does not disappoint when it comes to formulas, you'll find great consistency as I mentioned and no need for glitter fishing. The Celestial Trio will be back in stock tomorrow Friday August 1st! Don't miss out on a chance to own your favorite or if you can't choose get all three! Different sizing will be available. Which one is your favorite? Let me know down in the comments. I love hearing from you guys. I've had to put the word verification back on comments because I was receiving about forty spam comments a day. Sorry :( Until I find a better solution, it'll have to say on.